Whatever your reason for buying an air purifier, rest assured that there is one out there that will meet your unique needs. This review will help you narrow down your choices and find the right one for you. First you'll find a table where you can quickly compare the main features. Then you can read mini reviews of each of the five models. I've also included links to individual reviews, in case you'd like more in-depth information. If you're pressed for time, you can jump to whatever interests you in the Quick Navigation. Or just scroll down to read the whole article. Where should I put my air purifier? How often should I run my air purifer? Conclusion: Which air purifier is best? Okay, here the details about each of the models. They're listed in order of the average retail price - least expensive to most expensive. 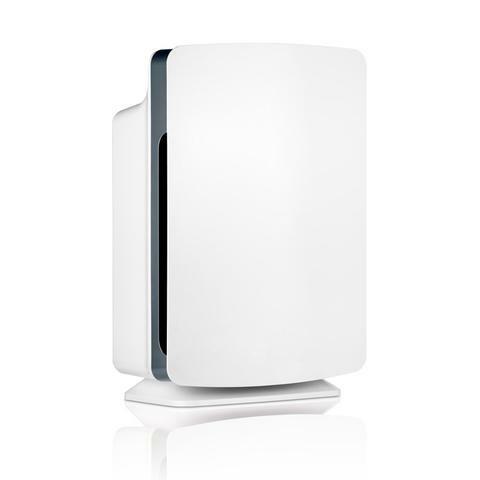 The GermGuardian AC5000E 3-in-1 Air Cleaning System is the least expensive of my top air purifier picks. There are a couple of reasons for the lower price. First, it has a lower CADR (125) than the others, so ​it doesn't cover a very large area. It's good for rooms up to 193 square feet. That's the size of a medium-size kitchen or small to medium-size bedroom. Also, there's nothing fancy about the AC5000E. No automatic timer or remote control or any other frills. Just a knob to turn it on to one of three speeds and a button to switch the UV-C light on and off. a UV-C light that kills germs and bacteria in the air. It's the same type of technology that hospitals use. You can vacuum off the pre-filter, but you have to replace the combination carbon/HEPA filter every 6-9 months. An indicator light on the unit tells you when it's time to replace it. 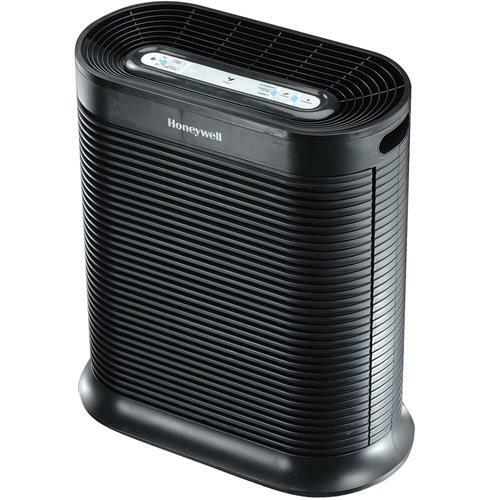 ​The HPA300 True HEPA Whole Room Air Purifier with Allergen Remover is a budget-friendly air purifier that has earned a high rating from Consumer Reports. It does an excellent job of filtering out smoke, dust and pollen, and can cover an area up to 465 square feet. ​With four speeds and a programmable timer, you can set it to run exactly how you need it. It also has an indicator that tells you when it's time to replace the filters. This is a great choice for bedrooms because it's quiet and because you can dim the LED display light. It's not going to interfere with your sleep. 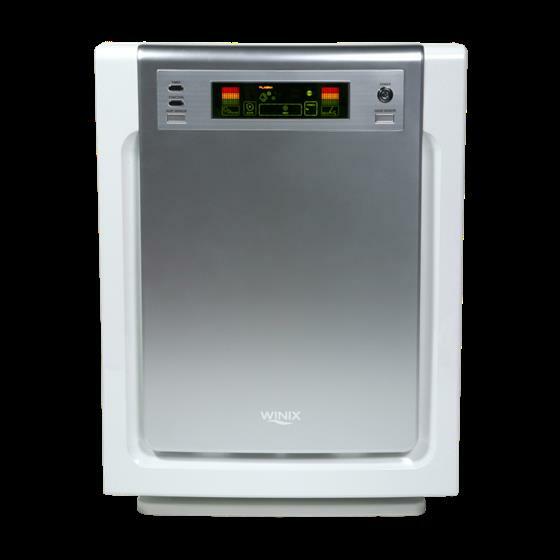 The Winix WAC9500 Ultimate Pet True HEPA Air Cleaner with PlasmaWave Technology is a good all-around air purifier, but it's especially effective for removing pet hair, dander and odors. washable pre-filter that collects a ton of pet hair, lint, etc. It has a decent CADR - 183/182/194 (smoke/dust/pollen) - and covers an area up to 283 square feet. That's about the size of an average family room or large bedroom. Smart Sensors on the WAC9500 can detect dust, odors and light and adjust the fan speed automatically. It also has a handy remote control and a filter replacement indicator. If you're looking for an exceptionally quiet air purifier, then you'll want to check out the Rabbit Air BioGS 2.0 Ultra Quiet HEPA Air Purifier (SPA-550A). The secret to the quiet operation is the Brushless Direct Current Motor (BLDC), which is more efficient and more powerful than traditional brushed motors. It also makes a lot less noise. ​Another feature that sets the Rabbit Air apart is its special BioGS HEPA filter. It traps airborne allergens like any HEPA filter, but it goes a step further. Normally, the allergens continue to build up and build up, but the BioGS filter works to reduce the trapped particles. That means that the filter will last longer than a regular HEPA filter would. The Rabbit Air BioGS 2.0 does an excellent job of clearing the air of allergens and odors in spaces up to 550 square feet. You can wash and reuse the pre-filter, but the other two filters will need to be replaced every 18 months - if you run it continuously. If you only run it 12 hours a day, the filters can last up to 3 years. The Alen BreatheSmart Customizable Air Purifier is the most expensive one in this list. When you take a look at the features, you can understand why. It has a CADR of 300, and it covers up to 1,100 square feet. That's equivalent to a large kitchen, large dining room, and large living room, combined. A huge area! Not only that, but it's customizable. You can choose from 4 different HEPA filters to deal with specific air quality issues. ​There are also 14 different front panel covers to choose from, so you can match it to your decor. Note that the filter is a HEPA type, not a true HEPA. But it still removes 99% of particles in the air, as opposed to the 99.99% that you get with a true HEPA. Alen designed it this way because a true HEPA filter tends to restrict air flow. A restricted air flow requires a more powerful - hence noisier - motor to move such a high volume of air. Most people would not tolerate the noise, so they opted for the HEPA type rather than true HEPA filter. The pre-filter can be washed or vacuumed and reused. But, the HEPA filter has to be replaced every 6 to 18 months, depending on how dirty your air is and how much you run it. CADR stands for Clean Air Delivery Rate. It tells you the volume of air that a purifier delivers and how effective it is at filtering smoke, pollen and dust. The higher the numbers, the better, so be sure to compare the CADR when you're choosing between air purifiers. HEPA is an acronym for High Efficiency Particulate Air. A HEPA filter is made of a fine mesh material that traps tiny particles when air is forced through it. True HEPA filters trap up to 99.97% of particles down to 0.3 microns in size. HEPA type filters capture up to 99% of particles 2 microns and larger. If your main air quality issue is airborne allergens, you'll want to choose an air purifier with a True HEPA filter. If you only have one air purifier, you'll probably want to put it in the room where you spend the most time. Or if there's one room in particular that has bad quality air, you could put it there. ​As far as placement in the room goes, remember two things: air flow and safety. Keep it out of the way so that people don't trip over the cord or run into the device. You'll also find that ​your air purifier will work more efficiently if you keep the doors and windows shut. It's best to run the air purifier continuously. If you choose a model with multiple speed settings, you can have it run on low while you're away from home to save energy. So now it's decision time. How do you decide which air purifier is best for you? Take another look at the features and find the one that best matches your criteria. If none of these still seem like the right fit, you can click here to check out all the available HEPA air purifiers at Amazon.